THIS ATTRACTIVE WELL CARED FOR BEAUTY IS YOUR WINTER BLUES CURE! The moment you step through the door you see and feel the warmth and brightness of this home. The NANTUCKET plan is a favorite but, only a few exist. The home sports a great room with lake and long lake views, 3 bedrooms, a den and a pool bath for easy access from lanai or should you add a pool. The lanai is another entire living space ready for enjoyment and entertaining. Recently installed were hurricane strong shade screens for easy all weather protection. in mint condition, this home is ready for move in! Fine appointments are: Upgraded Wood Cabinetry throughout, Granite Counter Tops, Stainless Appliances, new Convection Microwave Oven, newer Washer and Dryer, Tile on the diagonal, Crown Molding, Wood Flooring in den, Surround Sound and warm neutral color throughout. All of this in a superb Central Bonita location. 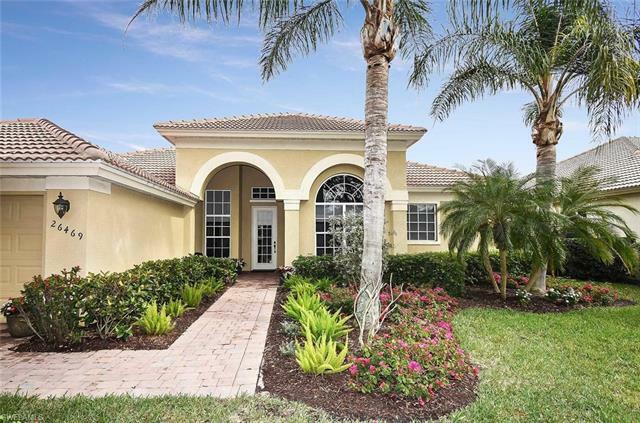 Hawthorne, A Hidden Jewel is convenient to RSW Airport, Beaches, Restaurants, Fresh Market, Publix, Coconut Point Mall, Miromar Mall, Naples and area attractions. This is a warm, friendly, socially active community. Walk miles throughout lakes, enjoy 2 Pools, Spas, Tennis, Fitness and Community Rooms.